DocuSign for Rentec Direct allows users to create or upload custom lease documents that you can electronically send to tenants for them to review and sign online. E-Signatures with Rentec Direct are legally binding and can be used with the forms editor for any important document that needs a signature, like owner agreements, rent increases and lease renewals. 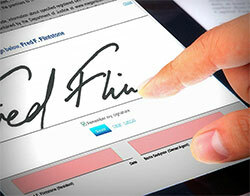 How to send and sign lease agreement online.